Whilst BLDGBLOG was out exploring the underside of Manhattan, from the island’s faucets to its outer city aqueducts, an email came through from Stanley Greenberg, photographic author of both Invisible New York: The Hidden Infrastructure of the City and Waterworks: A Photographic Journey through New York’s Hidden Water System. Greenberg’s photographic attraction is understandable. In his work, the New York City water supply reveals itself as a constellation of negative spaces: trapezoidal culverts, spillways, tunnels – cuts through the earth. His subject, in a sense, is terrain that is no longer there. These excavations, drained of their water, would form a networked monument to pure volume, inscribed into the bedrock of Hudson Valley. Such tales of hidden topology, of course, do not risk boring BLDGBLOG. One imagines, in fact, a slight resonance to the ground, Manhattan’s sidewalks – or Brooklyn’s – very subtly trembling with echo to those who know what lies below. As if the water system could even have been built, say, as a subterranean extension to the Brooklyn Academy of Music, a strange and amazing instrument drilled through rock, trumpeting with air pressure – a Symphony for the Hudson Valves, Bach’s Cantatas played through imperceptible reverberations of concrete and clay? 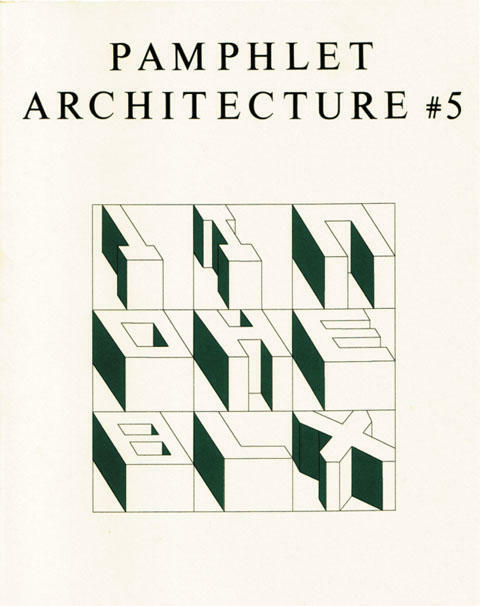 You can buy the book here; and you can read about Stanley Greenberg’s work all over the place, including here, here, and here (with photographic examples), and even on artnet. Earlier: Faucets of Manhattan and London Topological. [Image: From the LOMO Tokyo flickr pool; image by someone called wooooooo]. Shun even “claims to have uncovered a secret code that links a complex network of tunnels unknown to the general public. 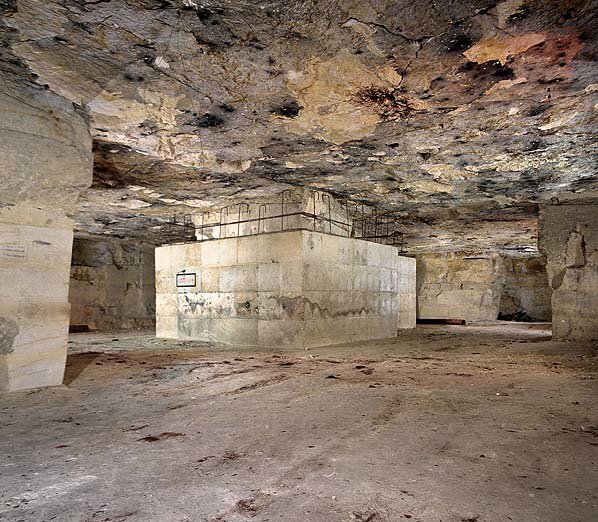 ‘Every city with a historic subterranean transport system has secrets,’ he says. ‘In London, for example, some lines are near the surface and others very deep, for no obvious reason. '” (Though everyone knows the Tube is a weaving diagram for extraterrestrials). 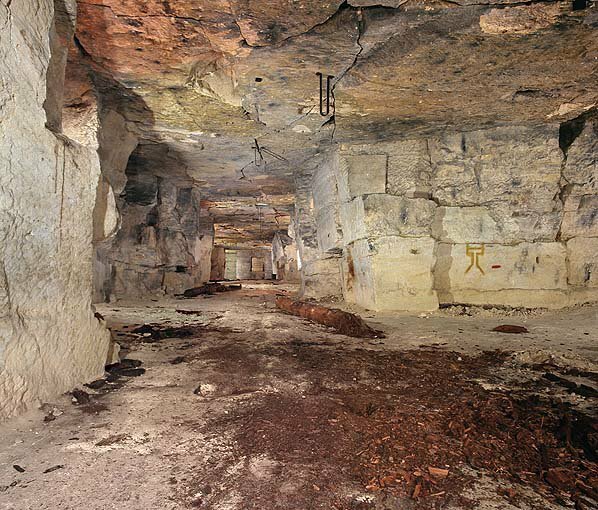 What’s going on beneath Tokyo? [Image: By Ozier Muhammad for The New York Times]. [Images: By Ozier Muhammad for The New York Times]. Jordan’s “precise map” of Manhattan bedrock would indeed be something to see; but until then, we can make an educated guess about the rock his tunnel will find by turning to Richard Fortey. 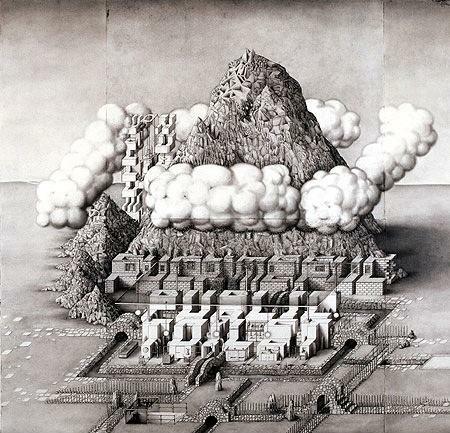 – which, awesomely, include Times Square, Carnegie Hall, Rockefeller Center, and the Museum of Modern Art, all floating above a sea of solid Manhattan Schist. In any case, the new tunnel being dug to power the faucets of Manhattan are supplements to the pharaonic, 19th-century Croton hydrological network that keeps New York in taps (including the now derelict, yet Historically Registered, Old Croton Aqueduct). You can read about the Croton Dam, for instance, here or here; and there’s yet more to learn about the Croton project, including how to follow it by trail, here. [Image: Photograph by Robert Polidori, from “City of Water” by David Grann, The New Yorker, September 1, 2003]. 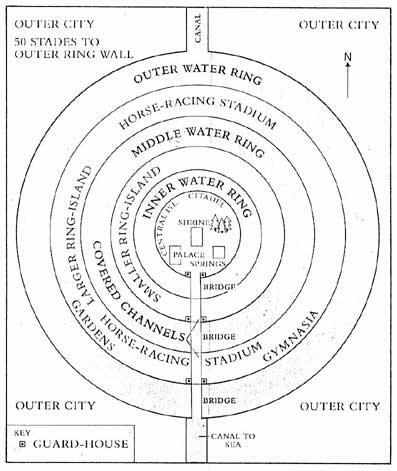 Finally, in 2003 The New Yorker published an excellent article by David Grann called “City of Water,” about, yes, City Tunnel No. 3. I’ll quote from it here briefly before urging you to find a copy at your local library and read it for yourself. Two main tunnels, he writes – and, thus, City Tunnel No. 3. But I’ll stop there – after I point out that toward the end of the ludicrously bad Die Hard III, Jeremy Irons temporarily escapes the less than threatening eye of Bruce Willis by driving out of Manhattan through similar such aqueducting tunnels. (For more tunnels: See BLDGBLOG’s London Topological or The Great Man-Made River; then check out The Guardian on London’s so-called CTRL Project, with a quick visit to that city’s cranky old 19th-century sewers, the “capital’s bowels”… Enjoy!). 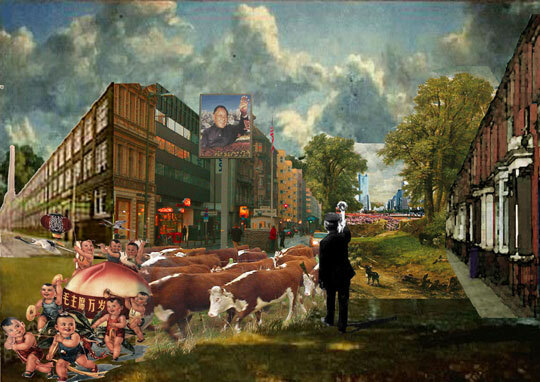 (For more on urban farming, see Pruned or Inhabitat). 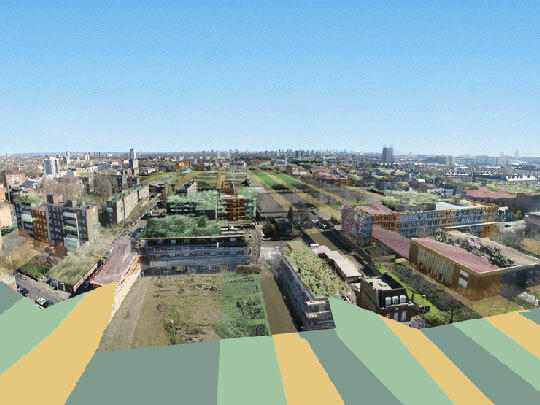 – which radically rethinks the landscape of Croydon’s roofs (and sounds really, really fun): “Taking the flat roofs of Croydon as our testbed,” they write, “we propose a new roofscape for the city – beaches, ice rinks, golf courses, allotments, skateboard parks and pasture refresh Croydon’s tired concrete.” How about a shooting range? (For more on green roofs, see Inhabitat). 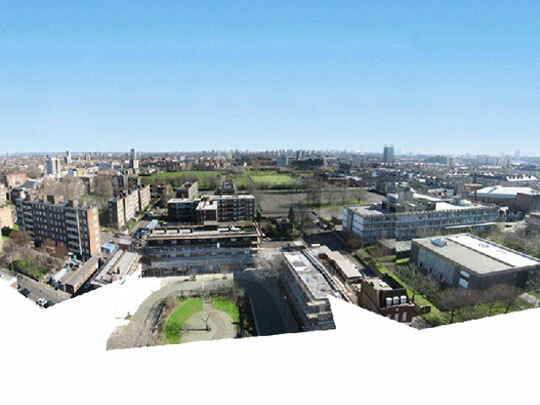 [Images: Hackney New Garden City, before and after]. For another place you could put those ideas to work, see Philadelphia’s Urban Voids; then check out these photos of “arbortecture” – or, plants growing out of buildings. (Via Pruned). As something of a sequel to BLDGBLOG’s earlier post, Britain of Drains, we re-enter the sub-Britannic topology of interlinked tunnels, drains, sewers, Tubes and bunkers that curve beneath London, Greater London, England and the whole UK, in rhizomic tangles of unmappable, self-intersecting whorls. But that’s not the only disguised ventilation shaft: don’t forget the “dummy houses,” for instance, at 23-24 Leinster Gardens, London. Mere façades, they aren’t buildings at all, but vents for the underworld, disguised as faux-Georgian flats. (This reminds me, of course, of a scene from Foucault’s Pendulum, where the narrator is told that, “People walk by and they don’t know the truth… That the house is a fake. It’s a façade, an enclosure with no room, no interior. It is really a chimney, a ventilation flue that serves to release the vapors of the regional Métro. And once you know this you feel you are standing at the mouth of the underworld…”). My personal favorite by far, however, is British investigative journalist Duncan Campbell’s December 1980 piece for the New Statesman, now something of a cult classic in Urban Exploration circles. 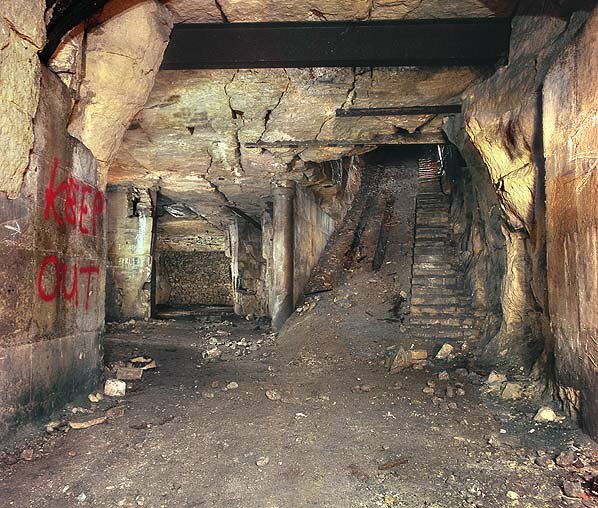 “Entering, without permission, from an access shaft situated on a traffic island in Bethnal Green Road he descended one hundred feet to meet a tunnel, designated L, stretching into the distance and strung with cables and lights.” He had, in other words, discovered a government bunker complex that stretched all the way to Whitehall. 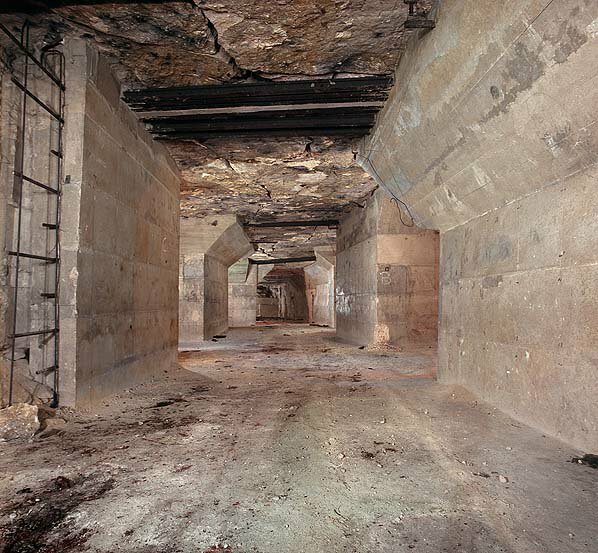 [Image: Like the final scene from a subterranean remake of Jacob’s Ladder (or a deleted scene from Creep [cheers, Timo]), it’s the Barnton Quarry, ROTOR Drain, Edinburgh; International Urban Glow]. Everything leads to everything else; there are doorways everywhere. It’s like a version of London rebuilt to entertain quantum physicists, with a dizzying self-intersection of systems hitting systems as layers of the city collide. 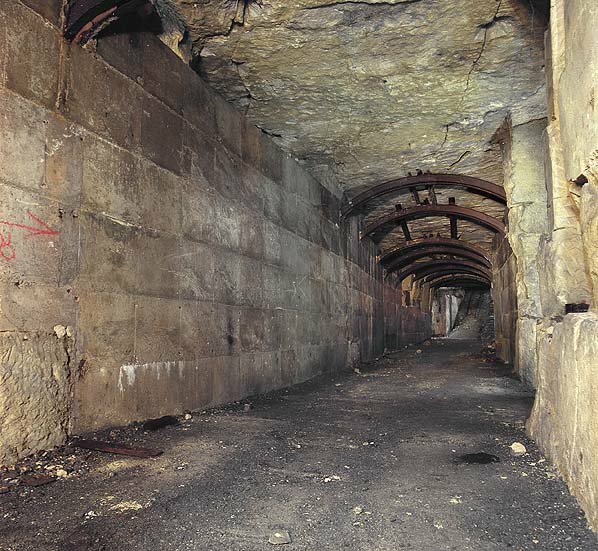 [Images: London’s Camden catacombs – “built in the 19th Century as stables for horses… [t]heir route can be traced from the distinctive cast-iron grilles set at regular intervals into the road surface; originally the only source of light for the horses below” – as photographed by Nick Catford of Subterranea Brittanica]. And for all of that, I haven’t even mentioned the so-called CTRL Project (the Channel Tunnel Rail Link); or Quatermass and the Pit, an old sci-fi film where deep tunnel Tube construction teams unearth a UFO; or the future possibilities such material all but demands. 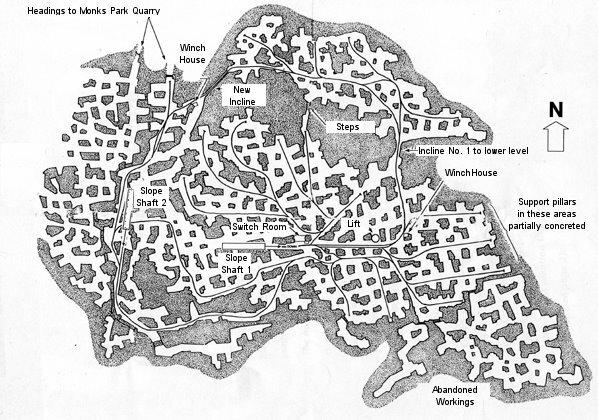 [Image: A map of Wiltshire’s Ridge quarry/bunker system; see below]. 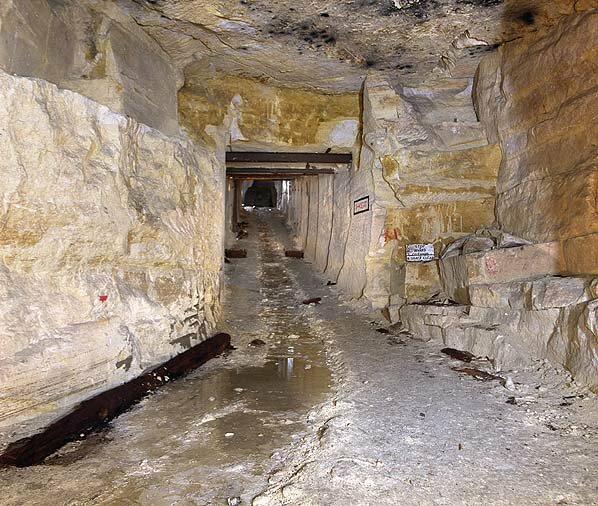 An article I’ve not only forwarded to several people but planned whole screenplays around, frankly, reveals that there is a sprawling complex of tunnels located beneath Belgrade. 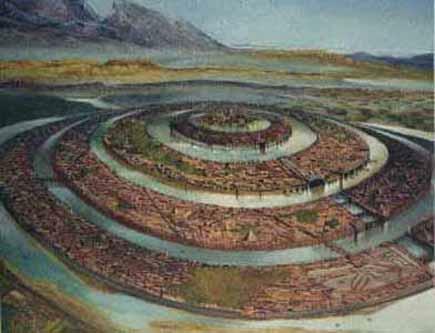 So how big is this concrete underground city? But hundreds of yards? That’s nothing. 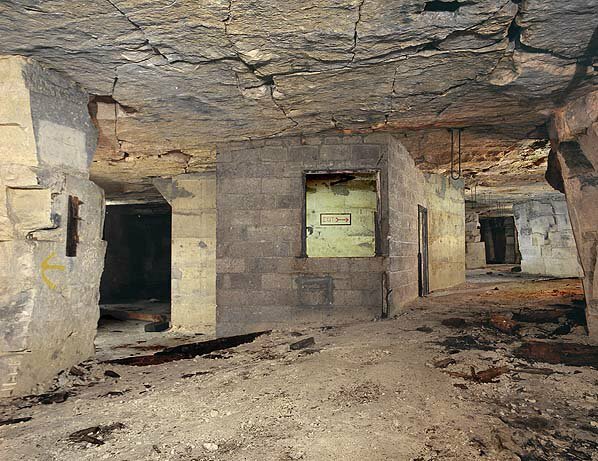 A secret, 240-acre underground bunker-city has recently come onto the UK housing market. 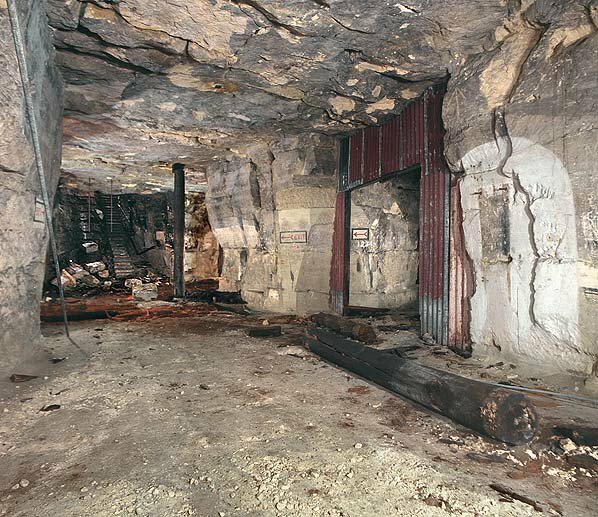 With 60 miles of tunnels, located 120 feet underground, the whole complex is worth about 5 million quid. Radio broadcasts echoing across a landscape of craters. 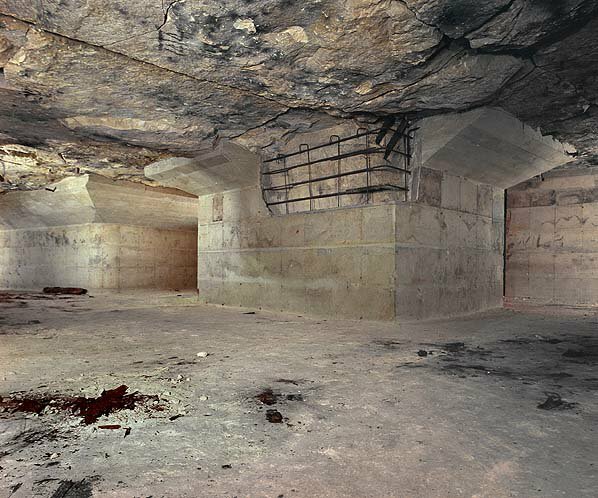 [A note on these images: these are all photographs – by the very talented and highly prolific Nick Catford – of the Ridge Quarry, in Corsham, Wiltshire, which geographically matches with the Times description, above. 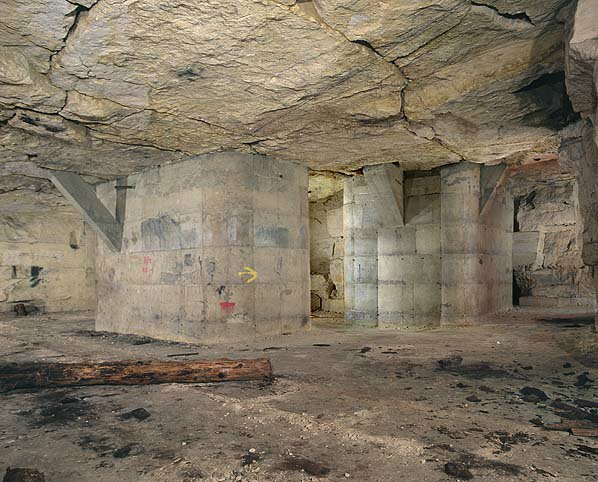 That said, the description of the Ridge Quarry provided by Subterranea Britannica does not seem to indicate that we are, in fact, looking at the same mine/quarry/bunker system. (There is a discrepancy in the amount of acreage, for instance). 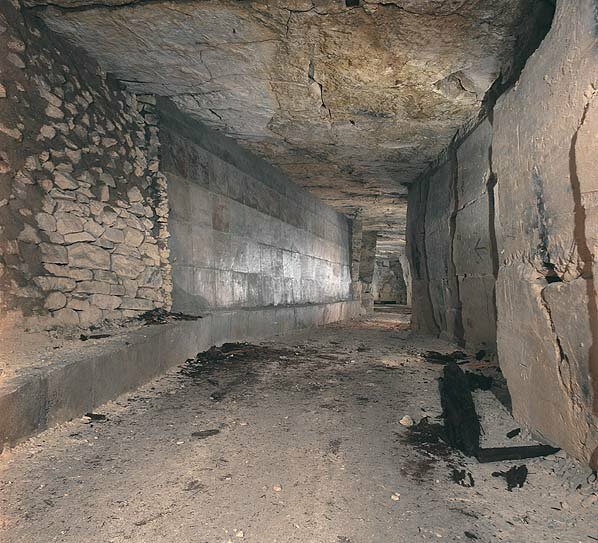 Anyone out there with info, thoughts, or other et ceteras, please feel free to comment… Either way, however, they’re cool images, and Subterranea Britannica is always worth a visit now and again]. The G-Cans Project reveals the quasi-mythic splendor of grandiose civic infrastructure, something the United States is ridding itself of entirely—yet also something Japan is now all but entombed within. The article is pretty amazing, actually, even shocking—though I do have to say that some of the projects it describes would be an engineer’s dream. But it comes with the realization that all this frenzied global construction may be more than just a bubble—see recent analyses of China’s own building boom, for instance—or Dubai—but a kind of hysteria, a building-pathology. One wonders, in fact, if there might be a disease, something Freud discovered, a neurosis of some kind: suddenly you start building things, and you don’t stop building things. You move beyond talking—building, building, always building—and soon you’re like the father in Close Encounters of the Third Kind, with mashed potatoes all over your hands and there’s a mountain in your living room. That, or you’ve just built the world’s largest sewer. [Images: See this ridiculously great website for loads more photographs – almost every one of which could be uploaded onto BLDGBLOG with open enthusiasm – as well as for relevant bits of info on tunnel locations and all further et ceteras; meanwhile, an upcoming BLDGBLOG entry will pursue more of this, with a London bias, soon]. An entrance to the topological undercity, a parallel world of drains and bricked abstract passages, monolithic concrete feeder chutes re-leading lost rivers through darkness. 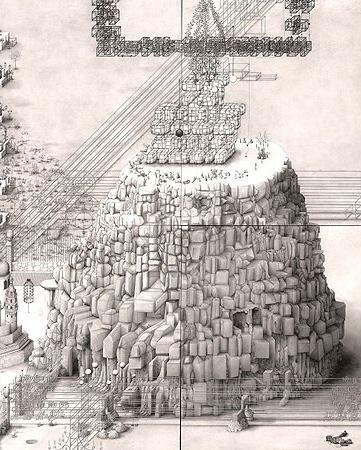 The “city,” in other words, was made of words. “Variously described as ‘3-D Scrabble tiles’ or ‘Lego blocks’, Noble’s pictograms name the buildings that they depict. From the hospital (Nobspital) to the cemetery (Nobsend) via the town centre (Nobson Central) or the Mall, citations from Omar Khayyam’s Rubaiyat, Gerard Winstanley’s letters to Oliver Cromwell or T.S. Eliot’s The Wasteland are camouflaged within the fields, the trees or the brickwork. 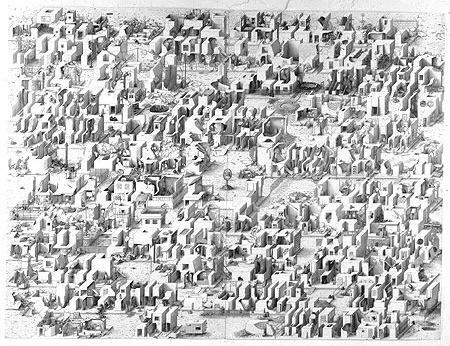 Noble’s project embodies a complex infrastructure of civil planning, social policies and historical perspectives” – and it was all done with pencil. (Book available here). But he wasn’t the first. Hello? One wonders which two-minute lunch break Holl took to draw those… Or was it thirty seconds? 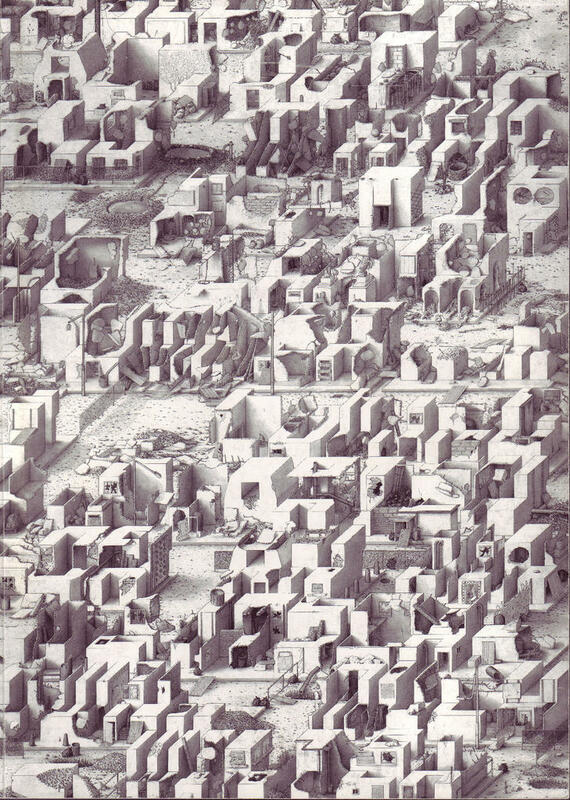 In any case, the creation of architectural space through a tweaking of the alphabet is not an inherently interesting proposition, but Noble’s eye-failure-inducing drawings reward repeated viewings. Just blink occasionally. New Orleans is not the only city to be faced with a future of indefinite flooding – nor is it the only city in the world below sealevel. The entire nation of the Netherlands, for instance, provides perhaps the most famous example of urbanized land reclaimed from the Atlantic seafloor. “Polders” is the Dutch name for such rigorously flood-controlled territory, and an exhibition literally even now being held at the Rotterdam-based Netherlands Architecture Institute explores the polders’ geotechnical creation. The polders’ “rationally organized landscape is unique, but also vulnerable,” the NAI explains. Vulnerable to overdevelopment – as well as to catastrophic flooding. 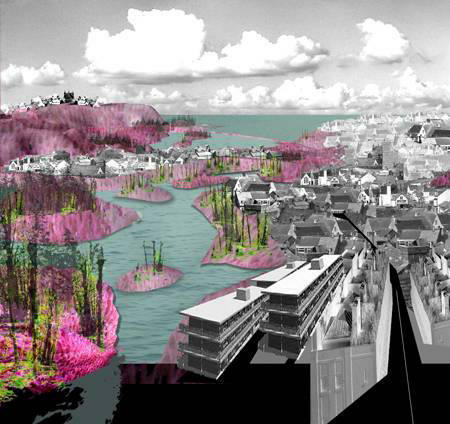 The 2005 Rotterdam International Architecture Biennale, in fact, takes nothing less than “The Flood” as its central, organizing theme – with one particular sub-focus being Water City*. 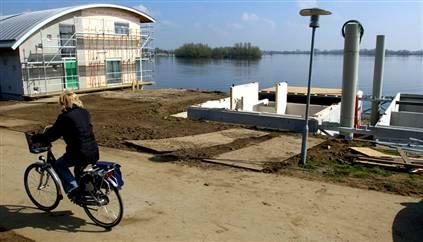 “The amphibious homes all look alike,” Kolbert says. Floating on the River Meuse in Maasbommel, “they resemble a row of toasters. Each one is moored to a metal pole and sits on a set of hollow concrete pontoons. Assuming that all goes according to plan, when the Meuse floods the homes will bob up and then, when the water recedes, they will gently be deposited back on land. Dura Vermeer is also working to construct buoyant roads and floating greenhouses” – the entire human race gone hydroponic. Further afield, the year 2005 has seen major flooding in Europe, India, and Bangladesh, to name but a few sites of major hydrological catastrophe. 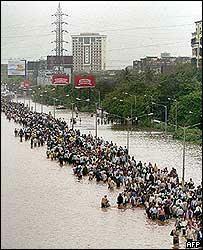 New Orleans, Rotterdam, Bangladesh, Mumbai: 2005 will be the year of flooded infrastructure and overwhelmed cities. And so if Atlantis sets the gold standard for civilizations lost to floods – forget Noah – then it’s interesting that Atlantis, even before Katrina occurred, was back in the news this year (though I suppose it is every year). As already explored elsewhere on BLDGBLOG, Atlantis’s island home may (or may not) be in the Straits of Gibraltar. Atlantis, city of dikes and levees, city of canals and inland seas, city of water-smart urban design and hydrological planning – it, too, was swallowed by the oceans, and destroyed. This thread continues in Katrina 1: Levee City (on military hydrology); and Katrina 3: Two anti-hurricane projects (on landscape climatology) – both on BLDGBLOG.